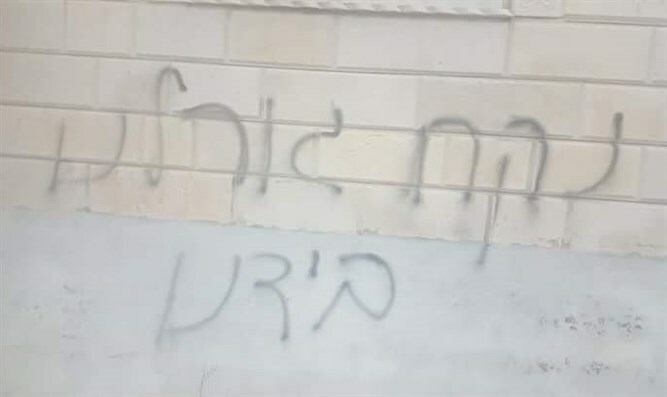 Prior to police investigation, leftist organization claims vandalism to be the fault of Jewish extremists. Vandals spray-painted graffiti on the walls of a mosque on Tuesday night, and punctured the tires of seven vehicles. The incident occurred in the Binyamin-region Arab town of Kariyot. On one of the mosque's walls, the graffiti read, "We will take our destiny into our own hands." Footage from security cameras revealed that there are three suspects. Israel Police have opened an investigation. However, the leftist "Rabbis for Human Rights" organization has declared the incident to be a Jewish-initiated "price tag" incident. Jews who enter Arab villages are routinely attacked by local Arabs, and security forces are always called in to rescue them.